Combine tomato, onion, basil, extra virgin olive oil & vinegar in a bowl. Season with salt & pepper and set aside. Preheat large fry pan over medium high heat for 2 minutes. Brush one side of each piece of bread with some olive oil and rub with half a clove of garlic. Place oil side down into the fry pan and press gently. Cook for 2 minutes or until golden and crisp. Turn over and cook for 30 seconds. Remove from the pan and place onto serving dish or plates. 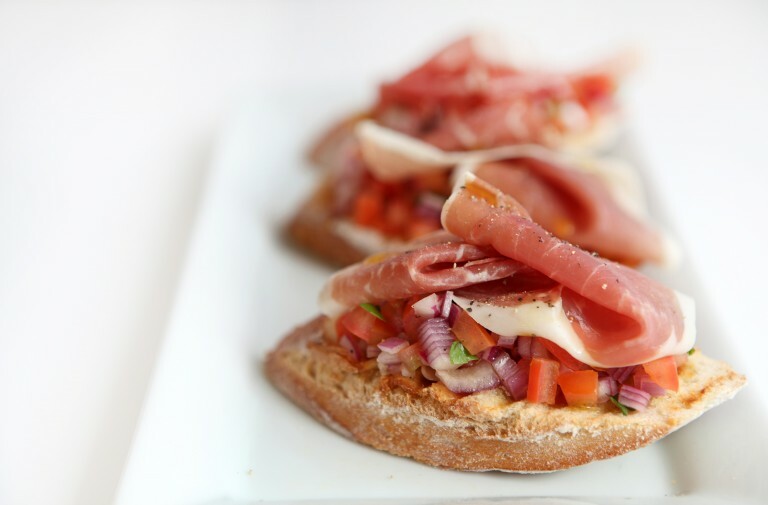 Divide tomato topping between the toasts and top with a slice of prosciutto.